NASA interns and staff sing out about their tenures with the space program in a new parody music video. NASA's Johnson Space Center interns have created yet another hilarious parody music video, with this latest one highlighting Scott Kelly's epic one-year mission aboard the International Space Station. The song, called "NASA Is Good," is based on Andy Grammer's "Honey, I'm Good." 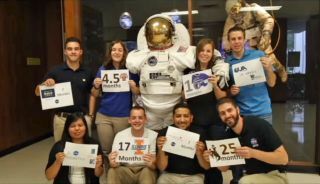 The awesome new music video shows NASA interns and long-time employees alike holding up signs showing how long they have worked at the agency. Space, of course, is shown, too — principally by following Scott Kelly, who is spending close to a year on the International Space Station. "A year-long trip with Scott Kelly will test long-term capabilities," the lyrics read. "He’s working with optical imaging, psychology — all the time: Labs sent up from all around the world." Another featured astronaut is NASA astronaut Doug Wheelock, shown bobbing on the grass and displaying several papers talking about his time in space during Expeditions 24 and 25. "Fixed the ISS toilet," reads one of his papers. He tosses it on the grass, revealing another: "12 times!" The video comes at a time when NASA is recruiting for its first class of astronauts since 2013. Besides showing space jobs, however, NASA said on its YouTube page that it also wants to show the fun things that people still in school can do at the agency. "The video features many different people working at Johnson Space Center, including current pathways and student interns as well as former interns," the agency wrote. Perhaps the most famous intern video was produced in 2012, called "NASA Johnson Style" (a parody of Psy's "Gagnam Style.") The video has dance sequences in NASA's Mission Control and an ISS simulator, and has racked up nearly 6 million views in three years.